Product Quick View gives your clients a great possibility to preview products using "next" and "previous" buttons, zoom product pictures to view all details, add to cart or to wishlist and a lot more. Preview Products on Magento category pages using AJAX pop-up windows. Clients can preview item, zoom images, share with friends, add to cart or to wishlist. Customizable Quick View Button. Set it as text or as an image. With Product Quick View Magento Extension, your customers will be able to have quick access to the product info with no need to load the product page itself. Due to the Magento preview product option, all the necessary details will be displayed in a small pop-up window. Site admin can also edit the contents of the custom Magento product preview form. Thus, it’s up to you whether to include the same information as in the product page, or select only the crucial information for your Magento quick view popup. We tested more Quick View extensions but this one is the best one - 5 star to the quality and support. What was more important - it works without any issues with our custom theme and other third-party extensions. Thank you very much. Thank you, it works as advertised! 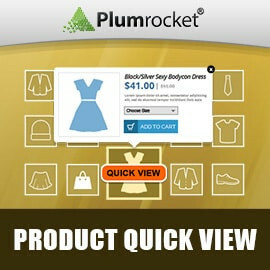 Once the the Product Quick View Magento Extension was installed it worked perfectly. I just wish that the Product Quick View Extension worked on the home page but besides that it works beautifully with the rest of the website. Very good Extension, as always fast installation and setup. Extension is very Fast and Efficient. Works very good and has a lot of nice Features. Mobile Optimization is very nice! Great extension that adds some extra usability to your magento site. Had to work with plumrocket as we had issues getting it working properly, and they didnt disappoint. Support has always been excellent, and in this case they resolved all the issues we had and provided the patched files in case we needed them in the future. they even fixed an extension from another developer to make sure everything played nicely together. I had minor design issues with custom theme but Plumrocket technical team fixed it and it is working perfectly now. Their support service is a top-notch and the extension looks and works wonderfully. The extension works exactly as it should. We totally like this module and what makes it 5 stars is its support which is perfect. These guys really know what are the doing! 5 stars for them! We've had this on our site for several months now and we get good feedback from customers that it has improved their browsing experience. Just a few clicks and you've got it set up. I should have bought it earlier! Every store needs it. My favourite one and I do recommend it! I would like to thank you plum rocket developers for this nice extension. I just bought it and already have it installed and customized for my theme. This took me less than an hour to make it look like I need. All elements of this extension can be changed, that is just great! Indeed, it is working nice on tablets and mobiles. notice for those who are still considering this product quick view - don't hesitate, go ahead and try it! These devs have good support online, and can be trusted.